Shahryar, king of India, inflamed with jealousy by his wife’s infidelity and wanton ways, executes her. After which he resolves to take revenge on all womankind. Hence, each night after having betrothed a beautiful girl, kills her the next morning. A stage comes when there is no eligible woman left for him (with many having fled his kingdom) except the daughter of his Wazir, Shahrazad. The Wazir, having no choice, gives his daughter to king Shahryar. Shahrazad, a beautiful but shrewd girl, learns of the king’s fondness for enchanting stories. Thus, she begins telling him one every night, keeping the climax in abeyance. Eager to know the outcome of the story’s ending, King Shahryar condones the killing everyday. Eventually, after a thousand and one nights, King Shahryar is cured of his euphoria, and Shahrazad in turn bears him three children. The cover page gives away the base of the story – A queen and her desperate efforts to stay alive within the king’s palace. 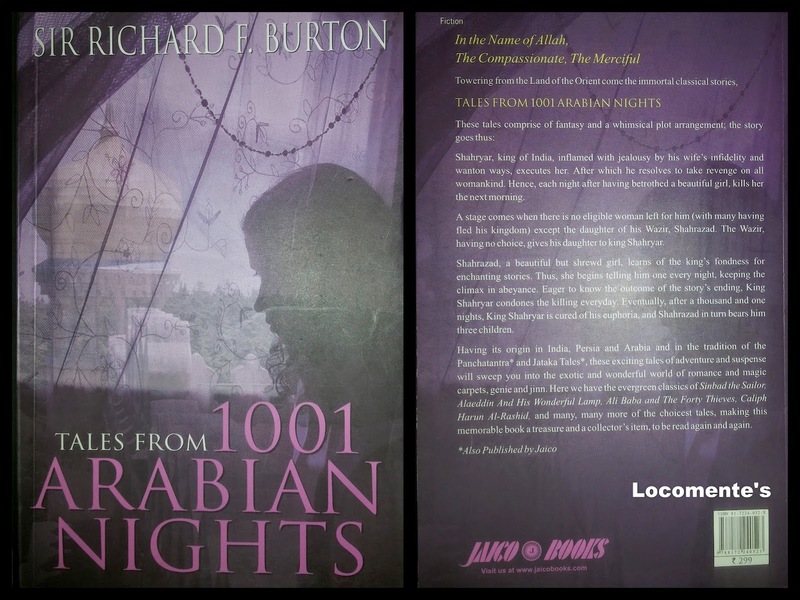 The book blurb is elaborate and talks about the specialty of 1001 Arabian nights. The book is a collection of stories told by Queen Shahrazad to King Shahryar every night. Disclaimer: I am not going to review this book. Come on, this is a classic… well read and something that has survived through the test of time. So, all I can say is read it… Savor it! The book is divided into two parts and each part has a set of stories. Each story has a magical effect and takes the reader to a surreal world. Also, each story enchants you and makes you wonder in disbelief. It also carries a subtle moral adding to its charm. Tales from 1001 Arabian Nights is one of those rare stories that would never lose its charm. Each story is still relevant and that is the best thing about it! The font is really bad. The line spacing is minimal and therefore it irritates eyes making long-readings painful. Classics like these are always a delight to read.